The future site of L-SPARK in Kanata, Ont. (Image: L-SPARK). Ottawa is getting a new accelerator, and it’s opening up its application process to startups and entrepreneurs today. L-SPARK, which will be housed in Kanata, Ont., a suburb of Ottawa, aims to work with companies that are geared towards serving the enterprise. The accelerator was born out of a partnership between Invest Ottawa and Wesley Clover International, an investment firm chaired by Sir Terence Matthews, who founded Mitel Networks in 1972. “Unlike many other incubators and accelerators, our sessions are unique because we focus solely on entrepreneurs who have a concept or product designed for existing and emerging enterprises, such as companies migrating to the cloud, companies using the software as a service (SaaS) business model and companies exploiting the move to virtualization in all aspects of running their business,” said Leo Lax, CEO of Skypoint Capital, in a statement. He will be the managing director at L-SPARK. 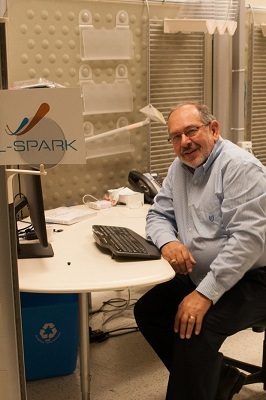 Leo Lax, managing director of L-SPARK. (Image: L-SPARK). The accelerator’s program will run for nine months, allowing for up to $360,000 in funding injections. It hopes to attract entrepreneurs from not just Ottawa, but also within the eastern Ontario area to participate in its program. Applicants can start applying today, and finalists will come to Ottawa in October to present their ideas at a “pitchfest.” L-SPARK will accept six companies into its first cohort. So far, one of its advisors includes Harley Finkelstein, chief platform officer at Shopify Inc., an e-commerce solutions provider that’s also one of Ottawa’s most well-known tech companies. Its first session should start later this year. Companies that want to apply to L-SPARK can head over here.